Trolls is an online video slot machine game from Net Entertainment that has been released in March 2011. This online video slot game has 5 reels and 20 pay lines. The theme of Trolls is based upon the supernatural creatures in Norse mythology and Scandinavian folklore. Even if they are not really familiar with the Norse myth, Scandinavia or even the Lord of the Rings Trilogy, many people have the basic idea of what a troll is. Trolls are described to be giant creatures with a primitive human-like appearance. They are extremely strong and they usually have long noses. In myths, they only go out at night because if a troll is touched by the sunlight, it will turn to stone. As for their intelligence, they typically have low IQ so they are often naïve and are very easy to trick. In the classic children’s story “The Three Billy Goats Gruff”, trolls are known to lurk under bridges and they try to eat people and other animals. Trolls are known to be vicious and evil, but there are some trolls who want to live a peaceful life and are therefore friendly with humans. Such is this slots game of Trolls – play with them for a bit and you will earn a great deal of riches! Many online slot players would love to play for free first whenever they encounter a new online slot game so that they can find out if they like that game enough to spend real money in it. Thus, every time they see that a particular online slot game is powered by Net Entertainment, they are certain that they can instantly play that game, without the hassle to download anything! Trolls online video slot is an absolute delight to play at, especially for those who love Norse mythology and adventure fantasy games! Trolls features Free Spins, scatter wins, a Wild Multiplier Symbol, a Golden Wild Multiplier Symbol, a maximum cash jackpot of $40,000, a maximum coin jackpot of 40,000, and last but not least, it has a 95.1% payout ratio! Famous for their high-quality graphics and realistically theme-related sound effects, Net Entertainment does a great job in creating the Trolls online slot machine game. 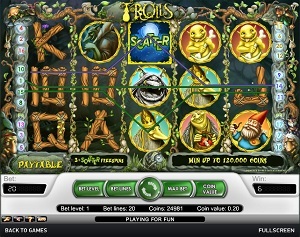 This particular online slot game is all about Trolls, their natural habitat and their way of life. The reels are separated by vines, and the pay line indicators have been designed on rock pillars. The background of the reels is of a solid color and it somewhat resembles like a huge boulder of cave (the natural home of trolls). The symbols drawn nicely complement the theme, and you will surely not strain or hurt your eyes if you play this game for a long time. The symbols will become animated whenever you form a winning combination, especially for the Wild and Scatter symbols. The overall graphic design of Pandora’s Box displays many different colors such as red, purple, blue, green, yellow, black, gray, orange, silver, brown and white. The background music that you will constantly hear in the Trolls online slot game sounds like the ones you usually will hear in adventure-type arcade games, with chirping birds, and a few sounds made from the Trolls themselves. Silly, childish but adorable sound effects can be heard whenever you hit a winning combination! The card deck symbols that are available in the Pandora’s Box online video slot game include 10, J, Q, K, and Ace. The regular symbols that are also used in the game are the Gnome, the King Troll, the Queen Troll, Trolls Guard, Troll Man Eater, and the Baby Troll. The Wild Symbol is the Trolls Tree. It acts as a substitute for all other symbols (except the Scatter symbol) in order to help you complete a winning combination. The Trolls Tree Wild Symbol in Trolls online video slot game is actually a Wild Multiplier Symbol. This means that it can double (multiplier x2) the payout of any winning combination you get, as long as it acts as a substitute symbol. There is only 1 winning combination to be paid out per pay line. If you get more than 1 possible winning combination on a pay line, you are then paid out the value of the highest combination only. In Trolls online slot game, you will encounter a Golden Wild symbol, which is a Wild Multiplier Symbol. It has two functions: (1) It acts as a substitute for all other symbols (except the Scatter symbol) in order to help you complete a winning combination; and (2) it quadruples (multiplier x4) your payout! The Golden Wild Multiplier Symbol only appears on the 3rd reel. The Scatter Symbol is the Full Moon. The Full Moon Scatter symbol is not required to come out in a line on an active pay line in order for you to win. The Scatter symbol can be found scattered anywhere on the 5 reels, as long as there are 2 or more Full Moon Scatter symbols that come out in a single spin. If you manage to hit 3 or more Scatter Symbols that are anywhere on the 5 reels, the Free Spin Bonus Feature game will be activated which can reward you with 10, 20 or even 30 Free Spins! During the Free Spin bonus game, all completed winning combinations are tripled (multiplier x3)! Please keep in mind that if you get a scatter win and a regular win, you will be paid out for both of these wins, because the Full Moon scatter symbol is not required to come out on an enabled pay line to win. Scatter rewards are entirely independent from pay line rewards and they are therefore included to the pay line win. Free Spin Bonus Feature Game – If you hit 3 or more Full Moon scatter symbols (that can be found scattered anywhere on the 5 reels), you will activate the Free Spin Bonus Feature game. If you hit 3 Full Moon scatter symbols, you will be awarded 10 Free Spins; if you hit 4, you will be awarded 20 Free Spins; and if you hit 5, you will be awarded 30 Free Spins! All of the winning combinations you complete while playing the Free Spin Bonus Feature game are tripled (multiplier x3). The Free Spin Bonus Feature game is very fun and exciting to play at because if you manage to get another 3 or more Full Moon Scatter symbols while still playing the Free Spin Bonus Feature game, you are rewarded another set of 10, 20, or 30 Free Spins and the same multiplier value! The extra Free Spins are included to your remaining amount of Free Spins. While in the Free Spin Bonus Feature game, you can win an infinite amount of extra Free Spins! When the Free Spin Bonus Feature game is over, you are then taken back to the main Trolls slot game, and your Free Spin game winnings are included to your win total. Trolls has 5 reels where you may bet on as many as 20 pay lines. The minimum bet is 0.01 and the maximum bet is 1.00. You may wager from 1 up to 4 coins per line. People who regularly play online casino games naturally love to stay much longer on online slot games that specifically have an Autoplay function. Good thing that Trolls has one! You can program the game to spin the reels for you automatically with the Autoplay function that can be found on the lower left side of the game screen. With the simple setting, just choose a button (from 10 to 1000) which means that those are the total number of spins that will be done automatically for you. With the advanced settings, you can choose to Stop Autoplay on any of the following conditions: on any win, if Free Spins is won, if a single wins exceeds a certain amount you indicate, or if your cash increases or decreases by a certain amount you indicate. After indicating your preferences, just click on the Start button, and the game will automatically spin for you while you just sit back, relax, and enjoy playing the Trolls online video slot machine game!